The FGD10-AM is an explosion protected ATEX and IECEx certified fixed gas detector for use in potentially explosive atmospheres. It is available with a RS485 output for use with Modbus in the process control industry or with the conventional 4-20mA output. It has an Multi Colour Graphics OLED colour display and magnetically operated switches which allow the unit to be calibrated through the display window using the magnetic pen without the need to remove the cover from the unit. This can also be carried out via the Modbus software. There is a flammable menu for the infrared hydrocarbon sensor which allows for the selection of the specific target gas. Three control relays are fitted to provide Alarm Level 1, Alarm Level 2 and Fault outputs via individual changeover contacts. 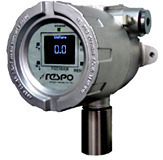 Fire and Gas Detection System India - Radiation Detection India by Respo Rae Systems - India for sensor detectors, Natural, Portable & Multi Gas Detectors. "RESPO" is synonymous to response and responsibility towards our Clients, Products, Principals and Services. We are market trendsetters because of our prompt attention and services at all times. We follow a rule of customer retention ship no matter what the circumstances are. Since our inception in 1992 we have done our best in keeping the 100% customer satisfaction and we have kept our promises in doing the same till date. We believe we are in a noble profession of keeping human life safe and work towards the environment protection.